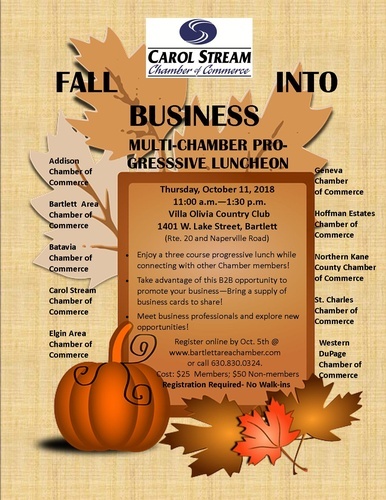 Join Addison, Bartlett, Batavia, Carol Stream, Elgin, Geneva, Hoffman Estates, Northern Kane County, St. Charles and Western DuPage for a Multi-Chamber Progressive Luncheon. Enjoy a three course progressive lunch while connecting with other Chamber members! Take advantage of this B2B opportunity to promote your business--Bring a supply of business cards to share! Meet business professionals and explore new opportunities!